There was a time when a housewife would gladly welcome a salesman into her home without a second thought, with just a tip of the cap and and a smile. The encyclopedia salesman, Fuller brush man, and the vacuum cleaner salesman, were just a few who brought the store to you, long before Amazon. Obviously those days are gone now, but I really look back to those times for inspiration for my work. A simpler time with simpler problems... Dirty carpet? No problem, Dandy Dan the Vacuum Man, is at your service. With Dan, I tried to capture the spirit of the retro advertisements of the 40's and 50's that I love so much. 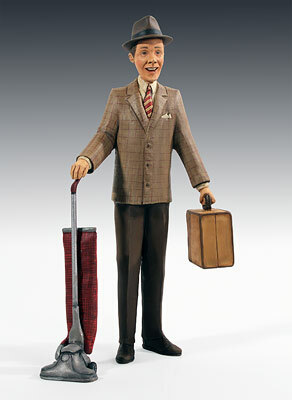 He is carved from Basswood, and painted with an antique finish.